Working towards a new season of festivals. The Steampunk Forum at Brass Goggles > General Steampunk > Tactile (Moderators: Herr Döktor, von Corax) > Working towards a new season of festivals. Re: Working towards a new season of festivals. NOW you're telling me, Otto Von Pifka! I'm a good part through the build, purchased foam and fur. A giant brown hairy snail doesn't look plausable, does it? 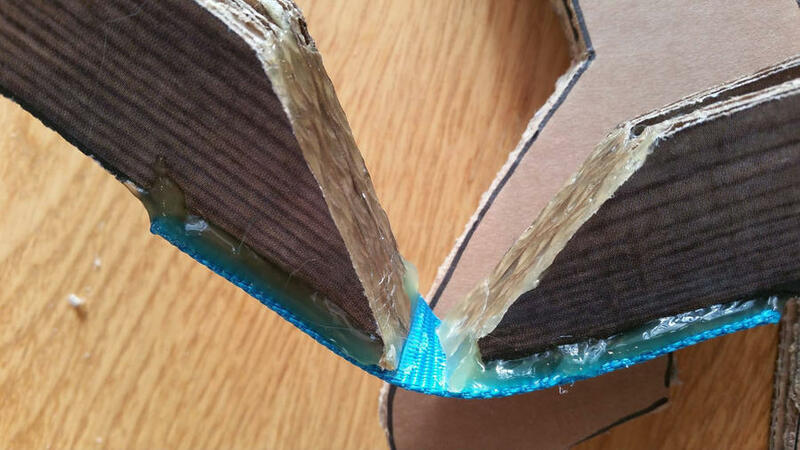 Hot glue works! Thank's for the tip! Nor does a giant, hairy brown wyvern! A huge step forward today. Finished the main structure. The joints bend a bit to weird, but I think I can fix that with elastic band. I might even limit the twisting ability in the joints. They are a bit to wobbly for my taste. The shoulders and hips should be more horizontal. Right now, gravity is pulling it all down, so eventually, the legs aren't going to crouch like they do now. Next, making ajustable elastic band tendants. As this build continues, adding foam and fur, the legs will fall differently. I want to be able to ajust the tention to counter ballance the additional weight. If all goes well, the legs should bounce a little bit to make it look more alive. The fluffy fur is going to add that motion. Think of it like the austrich feathers on a muppet. The way it flows, adds to the life like movement of the puppet. For what I've gathered on information, most of the "life" of a puppet comes from these unorchistrated motions. My new big friend gets heavier every time. I might have to add a shoulder strap for me to rest my arms from time to time. Can just see that thing as a great, big, shaggy brown wolfhound! This is an exciting build. I've made a handsfree construction. it's a bit more brown then on the photo. The lighter shade hairs are gray. It does look like Orangutan hide in that picture. 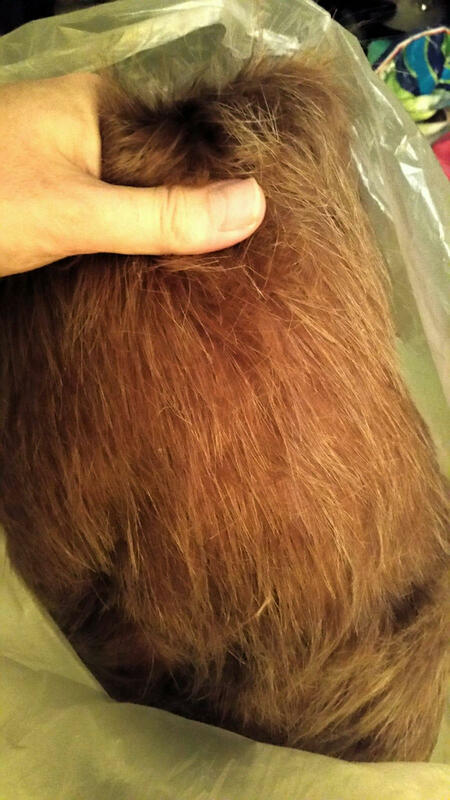 If the fur was a bit longer, it could go for a chewbacca. I had it rolled up on the floor the other day and the fur looked like a dog laying down. It fooled our little Jack Russel, she started barking at it! I've just found out that the knee joint (bitween bone 2 and 3) doesn't bend far enough. Shaving off the angle of the bones, make it less strong (more pointy, thinner). Lenghening the band joint is labour intensive, it might work, but also makes the joint more wobbly. I have to find a middle ground. The lowest joints, bitween bone 3 and 4, need some elastic band to keep it bouncing in that position, but also needs something to keep it going to far in. Probably some foam to spring it back. I have redone the right hind leg, making it more flexible. It should be able to sit nice. The elastic bands work as a pendulum, so I only need a few Cm's of finger motion to make it rock back and forth like it's walking. Last picture before bedtime. Please don't mind the mess. All legs attached, with elastic band and a string to operate. 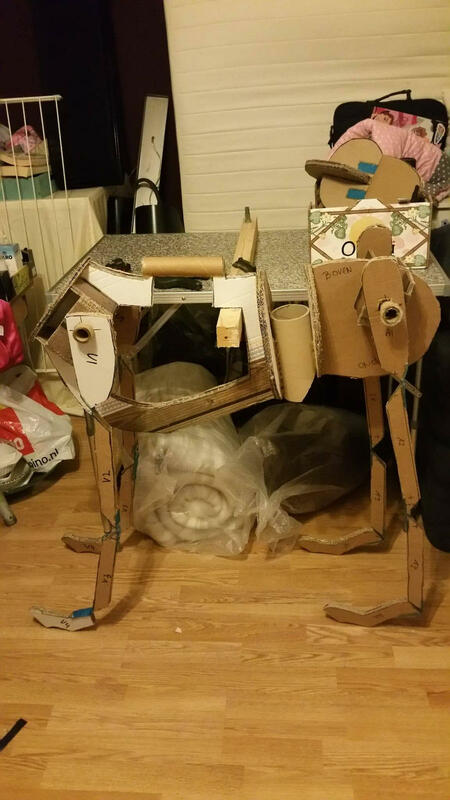 It can now sit like a real dog. I've added a neck and attached the head to it. I might shorten the hind legs as they tend to be a bit to long. I'm trying to imagine the legs with "muscle tissue". The hind legs should look like chicken thighs. So imagine a big triangular shape from the hips down to the knee and straight up to the waist. My wife was at awe to see the size of the dog coming about. 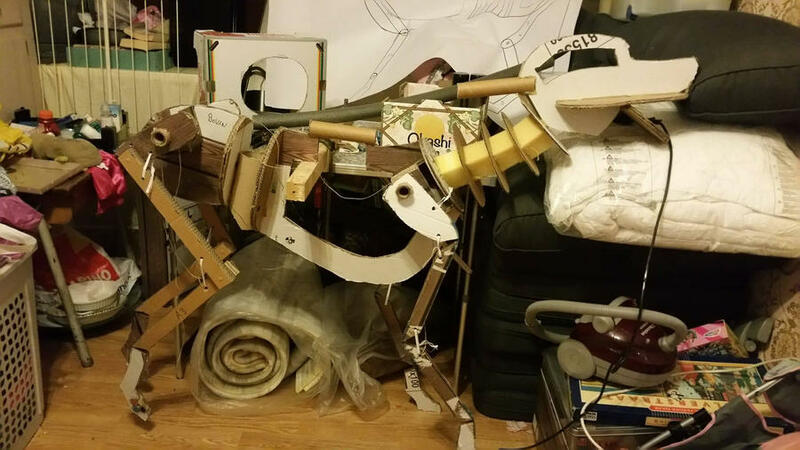 The main shape and structure is done and the dog is HUGE!!! Now to add foam and cover up the cardboard. From now on, the dog is going to get more bulky. Mess, what mess! Looks like my back room, only with a dog in it - oh, I forgot, there is a greeen-ish-grey dog in there, somewhere! If you can see the floor it's not a mess! I will pass the last two comments to my wife and say:"See, the room is not a mess." I haven't done anything today, but I've found a couple of pictures and youtube films about puppet making. I'm going to shorten the hind legs. They are too long. I have found this as a reference for the muscles. On my Pinterest page I've gathered a lot more reference material. Before covering up the skeleton, I have to figure out how to operate the strings attached to the legs. 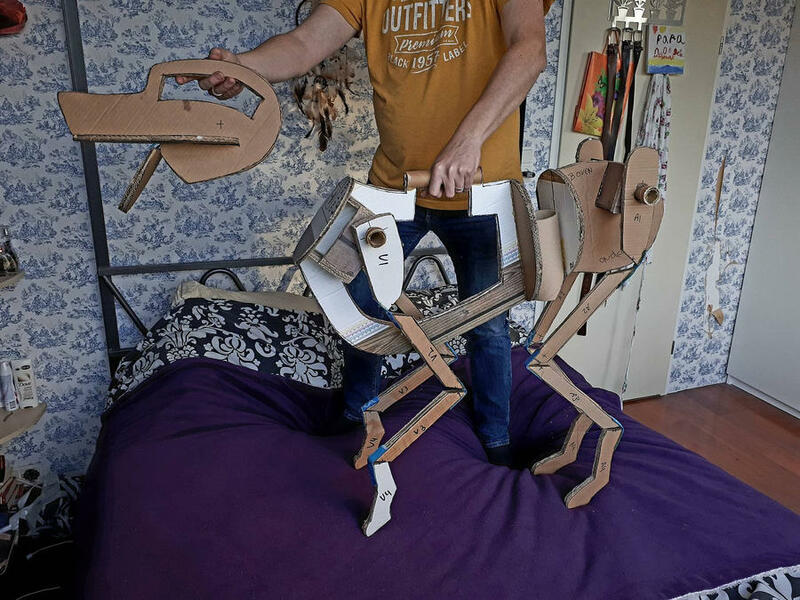 I've found out I only need a few cm's of motion to lift the legs. Perhaps a key ring with two strings might just do the trick. Meanwhile, I'm pondering on the head motions. What parts of the head do I want to be operatable? Ears, eyebrows, lips, mouth. I'm not thinking about moveable eyes. Just static dark brown eyes. With four motions on one hand, and holding on to the head, I think it is more than enough to make it realistic. I'm also reading (and youtubing) up to foam sculpting. Trying to figure out how to make a sturdy structure and how to make flexible, bendable parts. If all goes well, the foam should add to the structure. Limiting and guiding the cardboard skeleton. Also I'm looking ahead to the fur. The fabric I have, doesn't stretch. But I need some flexibility in the fabric. That means well placed folds and ruffles, perhaps overlapping layers of fabric, oversized parts allowing to allow flexing and bending. A lot of homework to do... and probably a lot of trail and error. My second post on page 1 shows a boy with a blue dog. I think that is a Limberjack. The boy holds the dog just touching the ground with it's paws. This puppet has a handle on it's back and one on it's head. My jointing arrangement limits the way the legs bend, but also guides the legs in a more natural way. If you want even bigger, look for "Royal de Luxe" on youtube. Small progress and minor setback. The front legs are shortended and I've added a platform where the rings will rest. I can operate the legs with the middle ring, but the legs travel way to little. Adding a second ring doens't help. I think I'm going to loop both legs string through the ring, creating a pully system. This way I can double the travel but also dubble the needed strength. If this doens't work, I'm afraid I'm going to have to go for the limberjack idea. Excellent. String* is one of the basics of mad science! String theory is just a theory. Unfortunatly the pully system doesn't work. But, with just dangling limbs, I can still make the dog sit and lay down. I might be able to drag/lift the legs in a way it looks like walking. The combination of rubber bands, foam and fur should give the illusion of a realistic moving dog. The head needs special care. I want a lot of movement in the facial expression. Moving the mouth, ears, eyes, lip curl. All operatable from the handle at the back of the head. And besides the mouth, all operatable by a thumb. I have a bicycle handlebar and break lever to operate the mouth. I can make three little levers on top of that. Perhaps with metal wire and soldering. Last try to make the legs work. 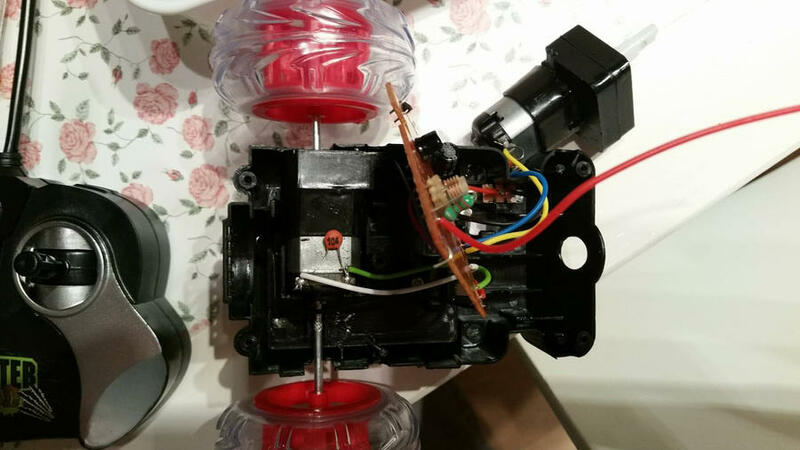 I've purchased a remote controlled car from our local "Dollar Store". 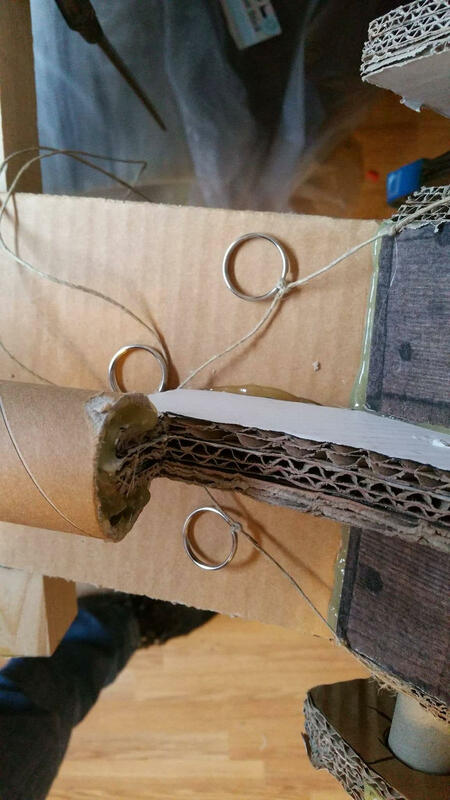 The idea is to use the motorised wheels as a way to roll the strings up and down. The car only costs a few euro, so it's worth a try. I have to give some credit to my wife, who thought of this idea. If it doesn't work out, I'll give her full credits. The vehicle feels like it has enough power and speed to move the strings. Now it is starting to get even more interesting. 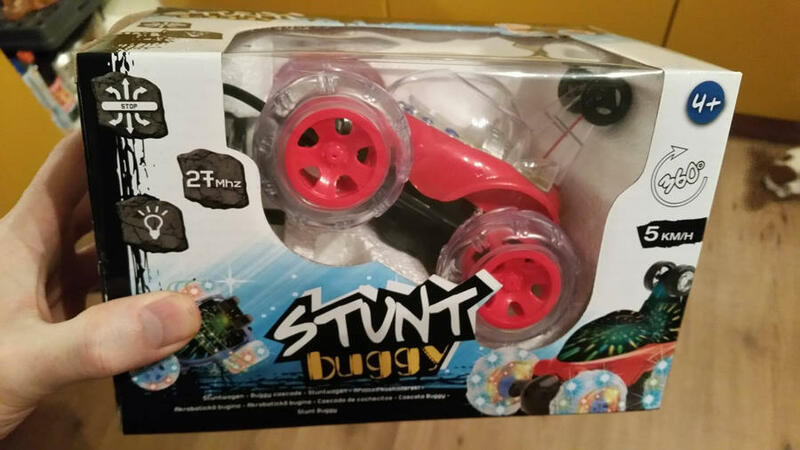 The stunt buggy authopsy is done. It seems like the motor that makes the front wheels spin has a slower, but stronger ratio than the rear wheels. I have a second buggy, so I can use two of the same motors. Next up, trying to figure out how to connect the strings to the motors.